St. George’s Cathedral, Jerusalem: May 20th, 2009. The Right Rev’d Suheil S. Dawani, Anglican Bishop in Jerusalem participated in a Conference on May 14 and 15th held at the Carter Center in Atlanta, Georgia. It was entitled - Towards a New Christian Consensus: Peace with Justice in the Holy Land”. The Conference was chaired by former President Jimmy Carter. 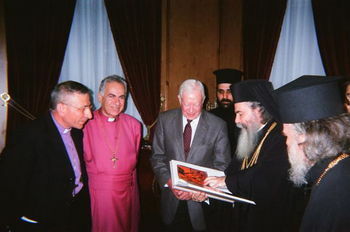 Among the participants with Carter Center personnel were leaders from The Kairos Project, Churches for Middle East Peace, and the World Council of Churches. Bishop Dawani was the only participant in the group from Jerusalem’s Palestinian Christian Community. The Conferees in anticipating the meeting between President Obama, Prime Minister Netanyahu as well as those with Arab Leaders, at other times, wrote a Letter to the U.S. President which stated: “As you prepare for meetings with Israeli, Palestinian and other Arab leaders, we offer you our support, encouragement and commitment”. “That hope is grounded in the growing consensus across the Christian community that supports a political solution to the Israeli-Palestinian conflict and the new leadership that you bring, both of which will make more possible a real, just and lasting two-state solution and an end to conflict in the region that upholds the security and freedom of both Israelis and Palestinians”. The Letter ended by saying “as members of your administration have already suggested, we share a concern about how Israeli settlements make that solution less and less possible. Furthermore, we are concerned that a way be found immediately to open the Gaza borders in a manner that respects both humanitarian and security concerns”. Bishop Dawani on his return to Jerusalem stated: “I was deeply impressed with the upbeat spirit at the Conference and especially in President Carter’s strong belief in the two State Solution to the Palestinian/Israeli conflict”. “The education and values of local Christians help to create respectful and constructive dialogue among people of different faiths and economic conditions. The urgency to preserve an indigenous Christian community in the Holy Land is crucial to its ability in continuing to serve as a moderating and reconciling element in the social and cultural fabric of the Middle East”. Following the Carter Center Conference Bishop Dawani stayed on in Atlanta as the guest of the Right Rev’d Dr. John Neil Alexander, Episcopal Bishop of Atlanta. On Sunday (May 17th) he was the Preacher at the Cathedral Church of St. Philip at the invitation of the Very Rev’d Dr. Samuel G. Candler, and the speaker at the Dean’s Adult Forum. The Cathedral is reputed to be among the five largest Episcopal congregations in the United States. Bishop Dawani in his Sermon and at the Forum spoke of the historic Christian presence – the “Living Stones” since the first Pentecost in the Hold Land. While facing many difficult challenges, they remain a vibrant ‘Community of Hope’. “Christians” he said, “as a community and individually, can and do play an important role in building bridges of dialogue between Christians, Jews and Muslims. And, these bridges” he stressed, “are vital for the dignity and security of all people in the region”. “While the challenges are sometimes overwhelming, we have chosen not to fall into thinking of ourselves as victims who are powerless. …. We see ourselves as servants of the “Risen” Christ, empowered to share His love in support of our people and our neighbors. …. The inspiration of the Resurrection gives us the Peace in our Hearts that God's Word is full of Hope and Truth”.